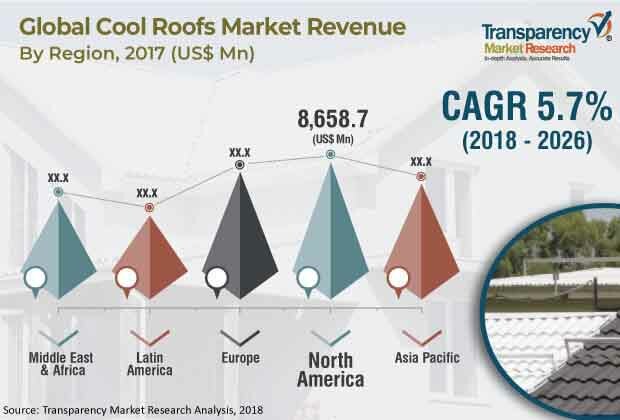 The global cool roofs market was valued at approximately US$ 12.6 Bn in 2017 and is projected to expand at a CAGR of 5.7% from 2018 to 2026, according to a new report published by Transparency Market Research (TMR) titled ‘Cool Roofs Market – Global Industry Analysis, Size, Share, Growth, Trends, and Forecast, 2018–2025.’ Expansion in the construction industries is expected to augment the demand for cool roofs from 2018 to 2026. The U.S. and Canada are anticipated to account for major share of the global cool roofs market during the forecast period. Increase in construction activities and rapid urbanization in emerging countries such as China and India are estimated to boost the market in Asia Pacific from 2018 to 2028. Rapid urbanization and increase in government initiatives in infrastructure activities in developing countries such as China and India is driving the cool roofs market. Cool roofs enhance durability of roofs, reduce building cooling loads, and lower the urban heat island effect. This is driving the demand for cool roofs. Furthermore, increase in demand for energy-saving building materials is rising. These materials are used in the renovation of commercial buildings and new homes. Cool roof materials enhance structures and help save energy costs. These roofs also promote environmental and economic sustainability. This is projected to boost the demand for cool roofs during the forecast period. The global cool roofs market has been segmented based on roof slope, roof type, and application. In terms of roof slope, the low slope roofs segment is poised to constitute the leading share of the global market from 2018 to 2026. Based on roof type, the single-ply membranes segment held major share of the market in 2017, owing to the high demand for durable, long lasting, and harsh-weather resistant roofing systems. Furthermore, single-ply membranes are flexible sheets made of PVC and thermoplastic olefins, which are the fastest growing materials in the construction industry. Single-ply membranes also offer comprehensive protection in all environments, including harsh weather conditions. They provide superior waterproofing protection to buildings and are highly durable. Modified bitumen and built-up roofing systems also contribute substantially to the cool roofs market. Modified bitumen systems possess high tensile strength and are unlikely to form cracks compared to their counterparts. Rise in demand for modified bitumen roofing type is augmenting the demand for bituminous roofing, thereby propelling modified bitumen and built-up roofing systems. Based on application, the residential segment is projected to hold dominant share of the global cool roofs market during the forecast period. Significant rise in number of apartments and high-rise buildings provides new opportunities to players operating in the cool roofs market. Furthermore, increase in demand for re-roofing and reflective roofs in the residential sector is driving the residential segment of the cool roofs market. Cool roof has been a preferred choice of material in residential building applications, owing to its energy cost savings and tax benefits offered by government schemes. These factors are fuelling the demand for cool roofs. For instance, governments of various developing and developed countries are providing incentives to implement energy-efficient and environment-friendly roofs. The cool roofs market in Asia Pacific is expanding at a significant pace during the forecast period. Rise in government initiatives to install cool roofs in the region due to the severe consequences of heat waves and rapid urbanization in emerging countries such as China, Indonesia, and Vietnam is driving the cool roofs market in Asia Pacific. Demand for retrofitting of residential complexes and need for low energy cost roofing systems is high in the U.S. This is estimated to boost the cool roofs market in North America during the forecast period. Middle East & Africa is expected to provide lucrative opportunities to the cool roofs market during the forecast period due to the rise in investment in the construction sector, which consists of commercial establishments, public infrastructure, and utilities, in the region. The report provides profiles of leading players operating in the global cool roofs market such as Owens Corning, Certain Teed Corporation, GAF Materials Corporation, Tamko Building Products Inc., IKO Industries Ltd., ATAS International Inc., Henry Company, PABCO Building Products, LLC., Malarkey Roofing, and Polyglass S.p.A. Expansion in the portfolio of cool roofs through improvement in existing products and development of new products with enhanced features is one of the key strategies adopted by several prominent companies operating in the cool roofs market.